FOR those in quest of a place for a peaceful holiday, Dharamsala can be a perfect retreat. Since it is the seat of the Dalai Lama and the Tibetan Government-in-Exile, the very presence of so many monks can have a calming effect on the nerves. From the pulls and pressures of city life one can instantly be transported into a world of peace and quiet where monasteries, fluttering white flags, prayer wheels and long nature walks can overtake senses. Though it takes only a couple of hours to reach Dharamsala from Delhi if one takes a flight to Gaggal, 13 km from the hill station, but the more scenic option of taking the overnight train to Pathankot and then on to a three-hour taxi ride to Dharamsala is recommended. The road runs through the gentle slopes of conifer forests, with the pristine beauty of the snow-capped Dhauladhars ranges in the backdrop. The view of willow clusters, pastures, apples orchards, apricot blossoms and fields of chilgozas pinenuts], which grow here in abundance, is exhi arating. After a three-hour journey of panoramic views lies the abode of Tenzin Gyatso —popularly known as the 14th Dalai Lama. Dharamsala lies in the Pir Panjal region of the Outer Himalayas. It commands a majestic view of the Kangra Kinner Kailash range that stands guard over this pristine hill resort, which has a monastery on a hilltop. Back in 1959 when the Dalai Lama fled Tibet and sought political asylum in India, the then Prime Minister Pandit Jawaharlal Nehru offered him and his followers, a refuge in Dharamsala, which had a hilly terrain like Tibet and would not greatly alter their lifestyles. Ever since then it has been called the Tibetan Kingdom in Exile or more popularly, the Little Lhasa of India. Interestingly, it was not out of some whim that Nehru opened the gates of Dharamsala to the self-exiled Tibetans. The move had a historical and spiritual angle to it. The Kangra valley is a repository of Buddhism and in the seventh century AD the Chinese monk-pilgrim, Hsuen Tsang wrote that he had located 50 functioning monasteries in this region around Dharamsala. Dharamsala actually consists of two hill resorts separated by around 10 km. The upper part is called McLeodganj, situated at a height of at 1,770 metres, which is the abode of the Dalai Lama. It is named after the Lt Governor of Punjab (1865-70) Sir Donald Friell McLeod and was one of the most favoured resorts of the British in the 19th century. The lower part is the district headquarters and has civil offices and business establishments with the district courts. Despite its administrative character the lower Dharamsala has not lost its tourist appeal. There is the gurgling`A0waterfall at Bhagsunath and also the Dal Lake (not to be confused with Srinagar). For those who like the great outdoors the high point is Dharmkot Hill where one can take a packaged lunch and while away lazy hours picnicking. Over the past half-century the Tibetans have built spectacular monasteries and nunneries here. Tsuglag Khang, or the Main Temple, is the centrepiece and the most valuable Buddhist temple outside Tibet. It is popularly called the temple of the Dalai Lama and has three imposing figures of Shakyamuni or the historical Buddha, Padmasambhava also known as Guru Rinpoche or the Second Buddha, who popularised Buddhism in Nepal, Tibet and China and Avalokitesvara or the Buddha of Compassion of whom the Dalai Lama is considered a reincarnation. Besides Tsuglag Khang there are many other Buddhist monasteries with an equally fascinating history. The Namgyal Monastery is a replica of the original 16th century monastery in Tibet. The Dip Tse-Chok Ling, too, is a replica of an eighteenth century monastery with the same name. 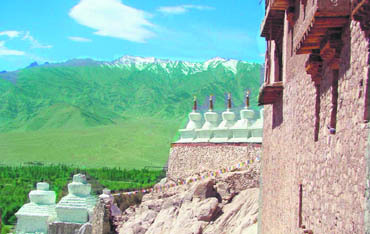 The Nechung Monastery is very significant. The monks in original monastery in Tibet have provided spiritual guidance to the Tibetan Government since the eighth century. The monastery was reduced to rubble during the Cultural Revolution. However, six monks managed to escape to India and have replicated the monastery in Dharamsala. Then there is the Namgyal Monastery. Apart from Buddhism the British, too, have left their imprint on the hill resort. 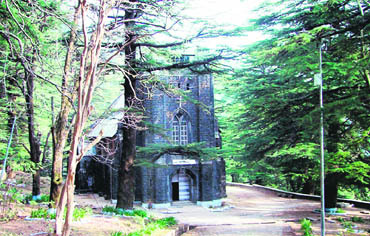 St. John’s Church-in-Wilderness is testimony to that. Lord Elgin, the British Viceroy of India (1862-1863), was so enchanted with the place as it reminded him of his native Scotland that he seriously contemplated shifting the summer capital from Shimla to Dharamsala. But before he could do that he died in 1863 and lies buried in the church cemetry. Dharamsala is indeed steeped in history. Outside of Tibet, this hill resort, nestling in the Dhauladhar ranges of Himachal Pradesh, is one of the most important centres of Buddhism.